Calamari & Chips - The Best Ever. Have you ever tasted paradise? I never thought it would be possible to pinpoint the best dish of my life. But, without a second of hesitation in my heart, mind and most significantly my taste - this is the one. As I have grown older, (and a wine tasting tour later), I have learned that food is far more than just something we consume for flavour, texture and taste. It’s much deeper than that. It’s the atmosphere, heat, climate and the company that you surround yourself with that makes it so memorable. 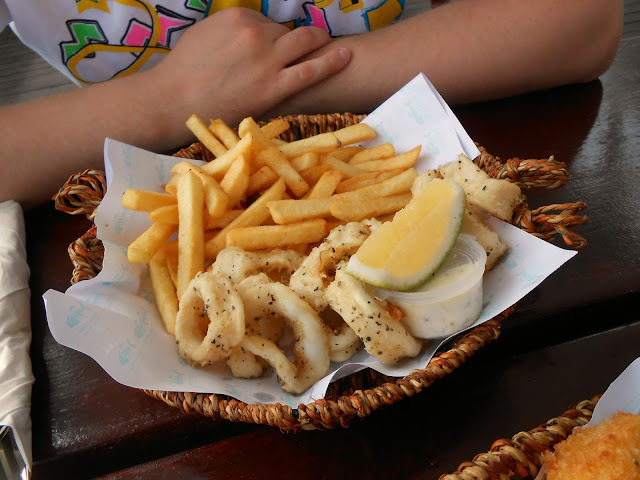 Calamari and Chips @ Neptunes, Fiji. Yes – it was on our honeymoon, in Fiji. We visited Neptunes early afternoon, in beach attire and decided there and then to try the salt and peppered calamari and chips. What arrived was far more spectacular than ever imagined. Presented in a wicker basket, this dish was lip smacking good. Calamari is by far one of my favourite foods. It’s funny because, anyone who knows me – knows I don’t eat chips regularly, or like literally at all. So, to say this dish contains chips is a bit of an oxymoron in itself! But, that being said when on honeymoon – why not eat something completely non-conventional for you. Neptunes is located within the Radisson Blu Hotel Fiji (where we stayed for our incredible honeymoon), it was so casual, sombre, relaxed and chilled. The bar served Fiji Gold for my husband, whilst I distinctively remember being amazed by a new discovery – papaw! I just know, one day we will be back. Food has a way of bringing around some incredible memories. Awww, I really love calamari. I wish I liked calamari because everyone always raves about it! Calamari is one of my all time favourites.